← Tom Savage: Venice, Via the V. I. In this post. John R. Corrigan meditates on the personal life experiences that can shape an author’s fiction. His story “Autumn’s Crossing” appears in the July/August issue of AHMM. 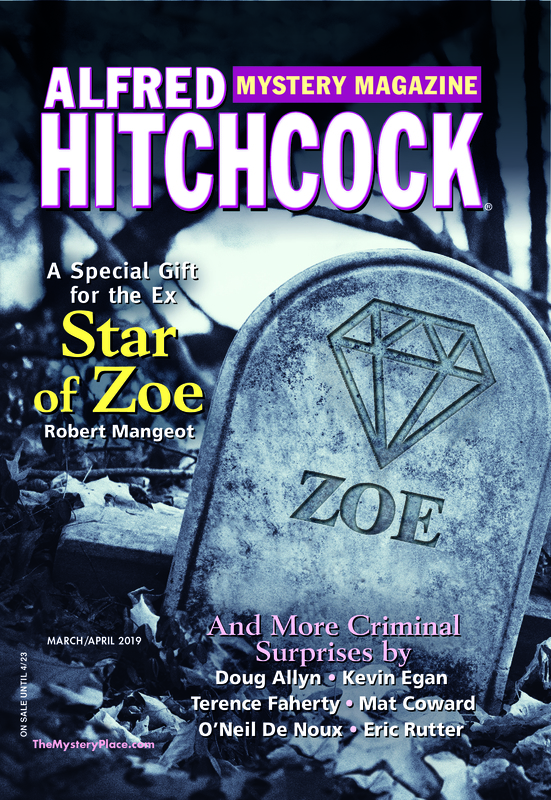 I hope you enjoy “Autumn’s Crossing.” Ironically, U.S. Customs and Border Protection Agent and single mom Peyton Cote owes her foray into the short-fiction genre to none other than Alfred Hitchcock Mystery Magazine Editor Linda Landrigan. I met Linda at Bouchercon in 2003. Her husband, John, was my book editor back then, and I was working on the second of what would be five Jack Austin PGA Tour novels. “Why don’t you write a short story?” Linda asked me at the awards dinner. I was sitting next to S. J. Rozan, whose novels and stories I adore, and I thought about S. J.’s ability to cast her series character in both short-story and book-length genres. So I considered it that evening. But after the conference I fell back into my daily routine of working on my novels in the early morning, teaching, coaching, parenting, sleeping deeply, and getting up and doing it all over again the next day. And so I forgot all about the short-story genre until a decade later, when I sent Linda a story. No longer was I working with her husband, so I sent a brief cover letter that was something along the lines of “I don’t know if you remember me, but you asked for a story. I’m ten years late, but here it is.” She bought that story and another and subsequently “Autumn’s Crossing,” which appears in this issue. Peyton Cote is a vast departure from Jack Austin, so I was thrilled when Linda wanted the story because the sale validated a risk I’m taking. You see, the short story bears the namesake (or, rather, title-sake) of a novel that my agent and I hope will launch a new series. All told, I’ve written three series characters, an amateur sleuth, a P.I., and a law-enforcement official, although not of the traditional ilk. Each character is unique from the others, and each has been created for a different reason. From 1999 to 2006, I published five novels in the Jack Austin series and spent an exorbitant, yet highly enjoyable, amount of time researching all things PGA Tour to do so. The books are—if such things exist—golf procedurals. I had grown up reading traditional P.I. novels—I loved Philip Marlowe and Spenser—and my Jack Austin books offer an amateur sleuth with a traditional P.I. code. Jack is a man of honor, one who does the right thing because it’s the right thing. Therefore, setting the books in the world of golf seemed natural. I was an athlete, having played college hockey. And I love and respect the game of golf and view it as the lone professional sport yet to be tarnished by performance-enhancing drugs; it is the final frontier where a competitor calls a penalty on himself and loses both riches and the fame that accompanies winning. It’s a game of integrity. If Philip Marlowe or Spenser were athletes, they’d be PGA Tour players. Just bigger and tougher than the guys you see on TV. But everything ends, and after more than a decade, I wanted to try something new. As crazy as it sounds, hockey actually led to my second series character, single-mom and U.S. Customs and Border Protection Agent Peyton Cote. Living along the Canadian border in Aroostook County, Maine, I started playing pickup hockey on Sunday nights with several U.S. Border Patrol agents. I love to research and wanted to write a law-enforcement series no one had written yet. The border patrol seemed the logical choice—I certainly couldn’t find much written on it. Problem was, I’d soon learn that was by design. The only thing harder than finding reading material on the border patrol was acquiring permission to ride along with an agent. It took three months to be cleared and a lot of locker-room chit chat, but eventually, I was granted several “border tours.” These tours are to be brief. Yet my smooth-skating hockey-playing brethren stretched these rides to several hours during which I’d watch, listen, and ask literally hundreds of questions. This information makes its way into my works by adding what I hope readers find to be rich details—items like black electrical tape covering dashboard instruments inside agents’ vehicles at night. Partly why I wanted to write Peyton Cote was the challenge she presented: I wanted to see if I could write a female. Jack Austin is a tough guy, a dyslexic, one I didn’t have to step far out of character to create. Peyton, by contrast, is a divorced single mom struggling to balance her career with her desire to be there for her son. Her mother, a traditional farm wife who lives nearby, is constantly troubled by the thought that her daughter not only works, but (God, save us) carries a gun. And her ex-husband somehow is always present, despite Peyton’s continual reminders that it’s over between them. I like conflict. I like dialogue. And I enjoy putting Peyton on stage with all these internal and external issues and seeing how she handles them. Getting the character and the voice of the novel version of Autumn’s Crossing just right took a lot of work, many drafts, and several years. Max Tyger, on the other hand, was written in under a year, while I was still tinkering with Peyton. He appears in This One Day (Five Star, December 2013), which will be published under the pseudonym K. A. Delaney. (My daughters are Keeley, 4; Audrey, 12; and Delaney, 15.) But it’s me; and this sleuth, a traditional P.I., is—once again—very different from the other two. If Jack Austin was created because I wanted to honor the traditions of the genre, and Peyton was spawned from my desire to challenge myself artistically, then Max was created because I was angry at the world. And writing was the best way to deal with that. In 2006, my father and I were grilling one evening. I took a piece of sausage off the grill, cut it in two, and handed a piece to him, then watched as he coughed it up. He hadn’t choked on the meat. Something had prevented it from going down. That was September. By December, he was diagnosed with stage-three esophageal cancer. At 7:14 a.m., on April Fool’s Day he died. I spent the first two weeks following his death in my back yard with a stack of two-foot-by-two-foot pool pavers, crushed stone, a radio, and a shovel. I dug, leveled, placed the pavers, and replaced them over and over again until I’d finished an outdoor patio. Alone. Just me and my thoughts. It was cathartic, but it wasn’t enough. I needed to write something about my father, about sitting in that goddamned ICU for three weeks as I watched him die. The result was This One Day featuring Max Tyger, a down-on-his-luck, Connecticut-based P.I. who’s just been diagnosed with stage-two esophageal cancer. He’s hired to find a teen who has been failed by all the adults in his life. Max is sick, but he sees the search for seventeen-year-old Tommy Lewis as a chance for redemption. And given the life he’s led, redemption means everything to him. It’s a dark book, written from a very dark place, but one I like a lot, and one that offers a character who I think has much more to say. My three series characters are all different, all born of unique circumstances. The only commonalities (at least those that their author sees) are that they have too much to say for a single book, and they’re fun as hell to write.